Owner of Kafka Granite serves as co-owner, crew chief, and sponsor to pro snowmobile team: When the snow falls, Glenn Kafka, owner of Kafka Granite, fuels his other passion: snowmobile racing. While Glenn had started becoming involved in snowmobile racing in the 1980s for fun, it has since evolved into another business venture. Glenn Kafka spent a decade serving as crew chief on the premiere grass drag racing team in the 90s, and another ten years helping his son, Chris Kafka, rise through the ranks of snocross racing. 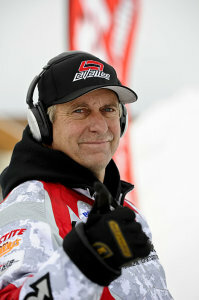 Today, he serves as co-owner and crew chief to Team LaVallee, a professional snocross and freestyle snowmobile team. Glenn’s business partner, Levi LaVallee, is a Pro National Snocross Champion, a 4-time Winter X-Games Gold Medalist, the first person to attempt a double backflip on a snowmobile, and the world distance jump holder at 412′ feet. Now, Glenn Kafka and the team are preparing for their fourth season together. Levi LaVallee and Kyle Pallin will be racing in the professional ranks, while Jake Scott competes in the Pro Lites division. The team will follow the International Series of Champions (ISOC) Circuit to nine US cities throughout the 2012-13 season, as well as compete in the 2013 Winter X-Games in Aspen, Colorado. The first race will be held November 23-25 at Spirit Mountain in Duluth, Minnesota. You can follow Team LaVallee on Facebook and Twitter, or see Glenn and the team in action at a race near you! Kafka Granite sponsors Team LaVallee, along with Mystik Lubricants, Loctite, Polaris, Parts Unlimited, Fox Shox, Earth, Inc., Woody’s, Kafka Conveyors, and Stratford Sign Company. In addition, Kafka Granite, Kafka Conveyors, River Valley Bank, and Stratford Sign Company will be sponsoring Chris Kafka, Glenn’s son, as he comes out of retirement to compete in the Midwest ISOC races as an independent Pro Lites rider. Kafka Granite participates in relief efforts: With thousands of homes destroyed due to Hurricane Sandy, families throughout the East Coast were left with little to nothing. Like many communities, Mosinee, Wisconsin joined the efforts to provide aid to these fellow Americans in need. The Mosinee Area Action Committee organized a relief effort, and Kafka Granite was part of the action. The goal? To send a 53-foot semi trailer filled with donated goods to New Jersey. Kafka Granite volunteered to serve as a drop off location. Throughout the weeks following Hurricane Sandy, families, church groups, businesses, and organizations from the Mosinee area dropped off new and gently used items at Kafka Granite. Our employees joined the relief effort, as many of them came to work with donated goods. By Friday, November 16, Kafka Granite’s storage space was piled high with non-perishable food, blankets, clothing, diapers, cleaning supplies, toiletries, and other items. Volunteers then packed up the goods and filled a 53-foot semi trailer, which left the following Sunday for New Jersey. Roehl Transport of Marshfield, Wisconsin donated the truck, driver, and fuel expenses. The donations will be delivered to the Community Food Bank of New Jersey, a subsidiary of Feeding America. The donations will then be distributed among 17 food pantries in some of the most devastated areas of New Jersey. Kafka Granite encourages you to join the relief efforts and find a drop off location in your community! Kafka Granite aggregate reduces accidents: If you have driven on an overpass in Wisconsin, chances are you’ve driven on Kafka Granite. Kafka Granite has supplied aggregate for high friction surfacing throughout the United States, including hundreds of bridge decks in Wisconsin. With winter approaching, this application will dramatically cut down on accidents that occur on overpasses. During the winter season, bridge decks become particularly slippery as cold from underneath allows for quicker freezing. However, high friction surfacing greatly increases traction, keeping vehicles on the road and drivers safe. In addition, the aggregate used in this application helps trap road salt, making the deicing process more efficient and effective. Kafka Granite’s aggregate is manufactured to meet Department of Transportation specifications for Wisconsin and several other states. The aggregate is applied quickly and easily as an epoxy overlay. After the existing bridge deck has been thoroughly cleaned, a two-part epoxy is spread evenly on the surface. Next, the aggregate is dispersed over the epoxy. Once the stone has set, the excess is swept away and can be reused. In addition to bridge decks, our epoxy overlay aggregates have been utilized for exit/entrance ramps, curves, crosswalks, pedestrian walkways and more. Interested in using Kafka Granite’s high friction surfacing aggregate to make your roads safer? Contact one of our knowledgeable sales representatives for more information, samples and pricing!